Continuing our season ending recap of the Brewers farm system, today we move on to the Crew's Double-A affiliate, the Huntsville Stars. I wouldn't call this a great team, but in the first half of the season they played like one. Huntsville won the first half and made the playoffs (and promptly lost in the first round). They're kind of an uninspiring bunch, aside from a couple of top prospects. Here are the Stars. Best Base Stealer: Adam Stern - CF - The minor league journeyman swiped 28 bases for Huntsville before being bumped up to Triple-A. Most Power: Drew T. Anderson - OF - Remember him? Got called up a couple years back in September? Well, no matter, somehow his 10 home runs led the team, and that's borderline absurd. Best Plate Presence: Jonathan Lucroy - C - The Brewers top catching prospect walked 78 times to finish the year with an OBP of .380. Extra Base Machine: Jonathan Lucroy - C - He also finished with 41 extra base hits, which was the most of any Star. Highest Average: Drew T. Anderson - OF - It's safe to call Anderson a journeyman as well, since he spent last year in another team's system. 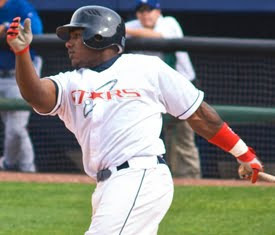 That said, Anderson led the Stars with a .301 average in 2009. Best Command: Zach Braddock - SP/RP - Braddock figured something out this year, in 40.1 innings between Brevard County and Huntsville he struck out 62 and walked only seven. Worst Defender: Kevin Melillo - 1B/INF - Who? Exactly. That it's not a top prospect is the best news we could have. The veteran minor leaguer led the team with 14 errors, which really isn't that bad. Best Hitter: Jonathan Lucroy - C - The former Ragin' Cajun (Louisiana-Lafayette, look it up) led the team in doubles (32), RBI's (66) and was second in home runs (9). He also walked more than he struck out. 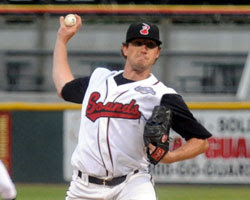 Best Pitcher: Josh Butler - SP - Butler managed to play for four different Brewers affiliates this season. 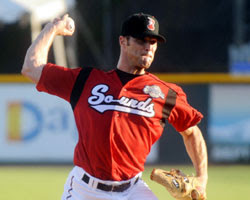 With Huntsville he threw 41 innings and had a 2.85 ERA to go along with 33 strikeouts and just 13 walks. Jonathan Lucroy - C - Nine home runs are a big dip for a player who hit 20 last season. But at Huntsville, Lucroy was by himself in the lineup. And he struggled for much of the first half but finished with good all-around numbers. He's defensively advanced and there's a reason the crew thinks of him as their top catching prospect. Josh Butler - SP - Also known as "the guy we traded Gabe Gross for." Talk about putting yourself on the map. Butler had an outstanding year, going 9-3 with a 2.97 ERA and earning a Major League call-up. His numbers improved with each more advanced minor league level (At Triple-A he struckout 15 and walked just one). If he continues to progress he could make the rotation in 2010 or 2011. Robert Wooten - RP - After setting the single season save record for Brevard County, Wooten was bumped to Huntsville. His command is impressive, he had 78 K's against just 22 walks and he's been a successful closer at every level he's pitched. Zach Braddock - SP/RP - He managed to stay moderately healthy, and has showed how electric his stuff is. The question for Braddock will be can he stay healthy enough to start? If he can he will be an impact starter for the Brewers, either way he has a big time arm. Mike Jones - SP - He pitched the whole year without injuring his pitching arm. Milwaukee's patience with Jones may finally be paying off. He finished the year with a 4.75 ERA but the big number is his 127 innings pitched. Hard not to root for a guy that's been through as many injuries as he has. Lorenzo Cain - CF - Through no fault of his own, Cain's stock has dropped in 2009. After tearing a ligament in his knee early in the season, he never really had a chance of putting up a big year. Cain hit just .218 through 60 games, hitting four homers and driving in 19. Still, he can redeem himself with a good Arizona Fall League performance and playing well at Triple-A in 2010. He'll have to, because Logan Schafer is knocking on the door. Taylor Green - 2B/3B - Much like Cain, Green was hampered with an injured wrist, only he had surgery before the season even started. Green had one good month, but on the whole struggled to get in the swing of things at Double-A. He hit .267 for the year but you need more than six home runs from a corner infielder. If he's going to surpass Mat Gamel on the prospect list, he'll need to improve. Nick Green - SP - Hey let's sign this guy as insurance for our Major League pitching staff! That didn't work out so much, but at least he did better at Double-A than Triple-A, where he had an ERA close to seven. More pitching is always better, but for a guy who started in Triple-A on the 40-man roster, it's disappointing to finish the season in Double-A and off the 40-man. Joshua Wahpepah - SP/RP - Wahpepah was somewhat of a decent prospect when he was in A-ball. But Double-A did not treat him well. In fact he fell so far that he was released by the team today. So I won't be making any projections as to where he'll be pitching in 2010. For the year he had an ERA over five a WHIP of 1.73. Wes Littleton - RP - A waiver claim from the Boston Red Sox, Littleton was absolutely horrendous. Much like Green, he started the year at Triple-A, on the 40-man roster and finished the year at Double-A and off the 40-man roster. The difference between the two is that Littleton struggled big time at Double-A as well. He finished the year with an ERA of 6.50 and more walks than strikeouts. Biggest Surprise: Mike Jones - SP - Call me a pessimist, but I'm going to be honest. I never thought he would make out of Single-A. I had written Jones into the annals of the Chris Saenzs and Nick Neugebauers of the world. But he proved me wrong, and pitched pretty well in the process, but that was just step one. Step two is next, and that will be pitching well in Triple-A and possibly spring training. Jones is a Minor League free agent this offseason, so he could choose to leave the organization. I sincerely hope he doesn't, after the patience the Brewers have shown with him. Biggest Disappointment: Lorenzo Cain - CF - Again, he was doomed after the knee injury. That said, he was so hyped and everyone was so high on him after the Arizona Fall League that very big things were expected from him. Hopefully big things are still to come, but in the meantime expectations should be tempered. Cain is considered a "Five tool" player, and those kinds of guys always manage to break your heart. For every Carl Crawford there are five Corey Pattersons. Let's just let Cain become whatever type of player he's going to be sans the hype.